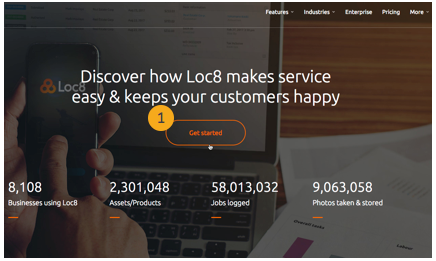 Signing up is the first step to obtaining the Loc8 Subscriber account that will let you perform all the features available in your chosen plan as the superuser. 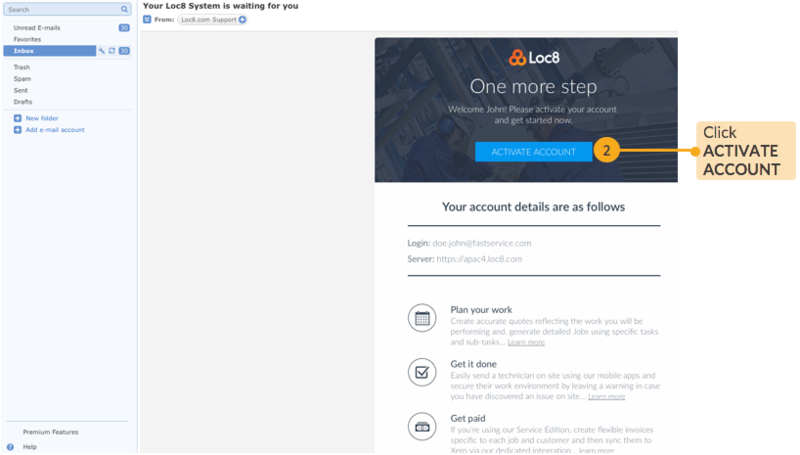 Just enter a few basic details, activate an account activation email and instantly launch Loc8. STEP 1 At www.loc8.com, click Get Started and fill in a few details to create an account. 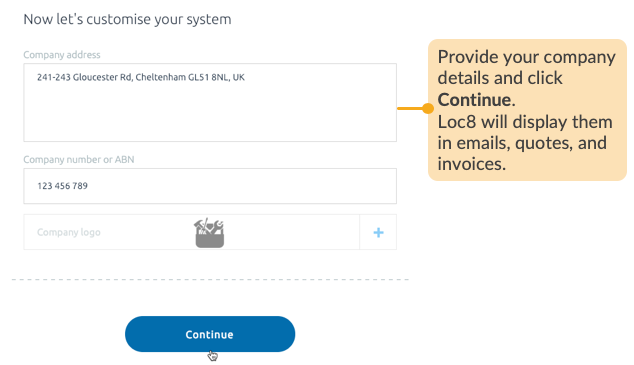 STEP 2 From your mailbox, open the message from Loc8 Support to complete account activation. The activation email doesn't take long to reach your inbox. At times, they reach the Spam/Junk folders, so please ensure you have checked all the folders. Your account has now been activated. Next, set up your profile. 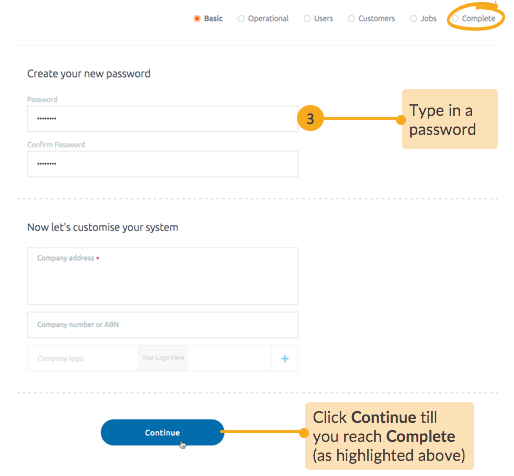 STEP 3 Create your login password. Your registered email address (that becomes your username) and your password will be used for subsequent sign-ins from both the web browser and Loc8 Mobile app. First Option: Directly choose to launch the application. 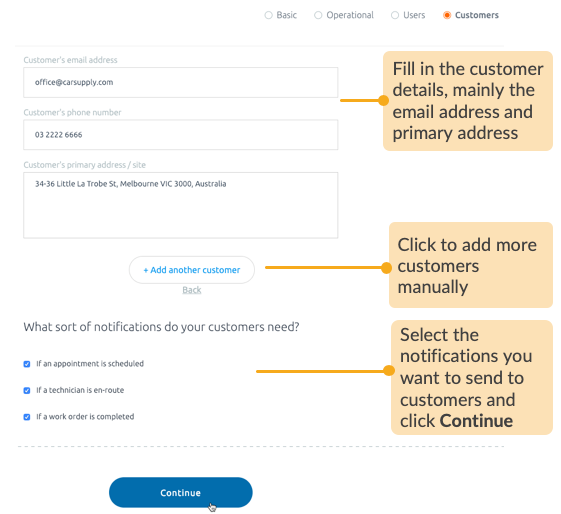 To do so, skip through the next couple of screens till you reach the final screen under the Complete section (as shown in STEP 4 after the Onboarding section). 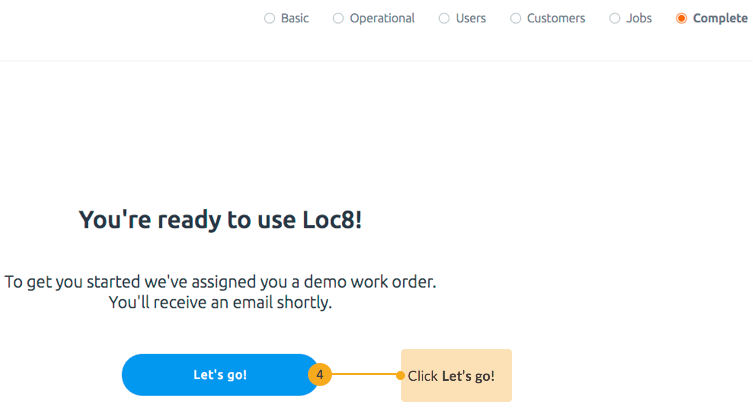 Second Option: Go through the Onboarding Steps in the following screens and equip your new Loc8 account with an initial set of data — a few customers and team members to start with, just to get a head-start when you land into the application for the first first time. With that, you can straightaway start creating jobs. If this option interests you, take a look at the Onboarding Steps below. If not, that's alright, you can always create/import data as and when necessary once you are inside the application. 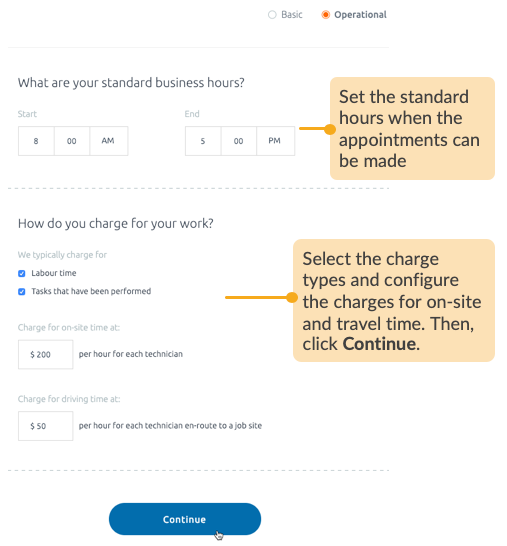 Configure your company's profile, business hours and standard work charges. 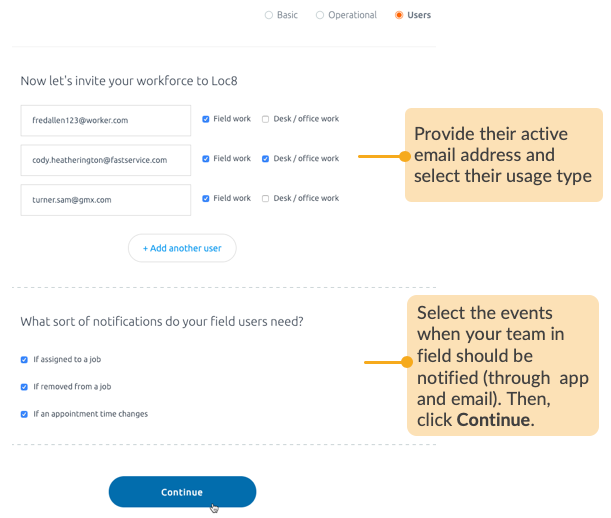 Invite the members of your workforce to Loc8, and set up notifications for them, which they would then receive in their Loc8 Mobile app as well as via email. Add a few customers to begin with. 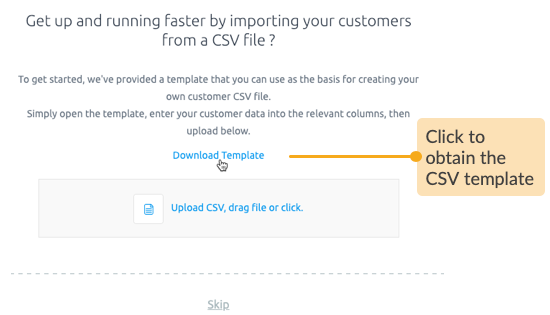 Fill in your customer details or maybe copy your company's record of customers into the downloaded template. NOTE: Please avoid changing the top header or the format of the downloaded CSV file to ensure successful import. Once you've uploaded your CSV file, each entry will be validated, and the result displayed with green ticks (correctly entered) or red crosses (needs correction). If any entry has a red cross, please rectify that data in your CSV file and upload it again. 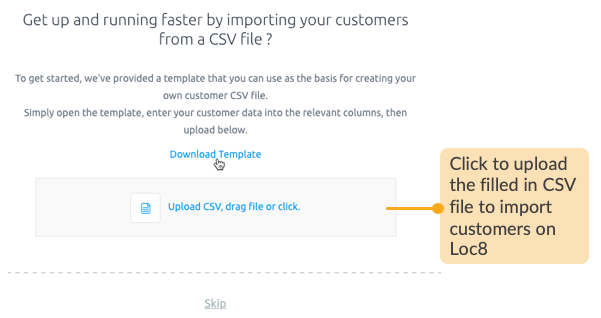 Find more example scenarios, and do's and don'ts for your CSV file explained in the article Import customers. 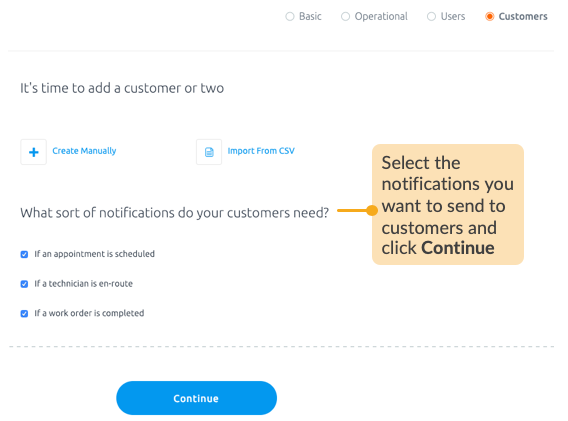 Set the notifications to keep your customers updated on their requested works via emails. STEP 4 Now, launch the application. With that, you'll be taken to your Loc8 Home screen. Check out the sample job provided to you in the Jobs tab, and explore the different attributes associated to the new job in its profile, you'll see all of that in a panel we refer to as the Job Inspector. If you'd like to get familiar with the Loc8 Home screen, please read our article Moving around Loc8. STEP 1 Tap GET STARTED and fill in a few details to create an account. Your account has been activated, next set up your profile. STEP 3 Create your login password. Your registered email address (that becomes your username) and your password will be used for subsequent sign-ins from both web browser and Loc8 Mobile app. First Option: Directly choose to launch the application. 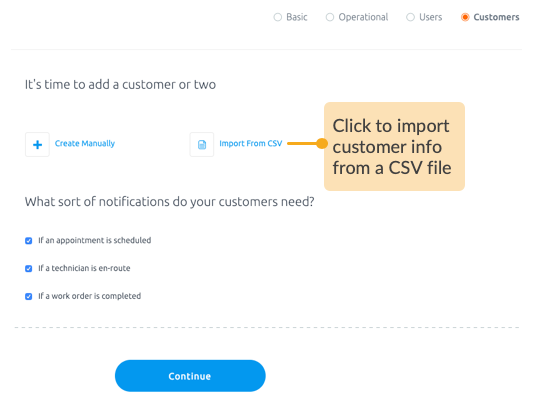 To do so, you need to skip through the screens till you reach the final screen under the Complete section (as shown in STEP 4 after the Onboarding section), you can always create the required data as and when necessary once you start using the app. 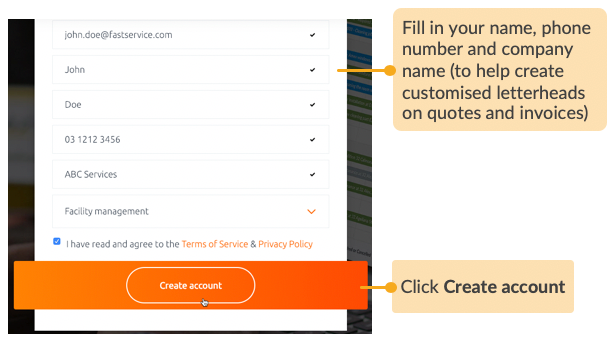 Second Option: Go through the Onboarding Steps in the following screens and equip your new Loc8 account with an initial set of data just to get a head-start when you land into the application for the first time. In this way, you can straightaway start creating jobs. If this option interests you, take a look at the Onboarding Steps below. 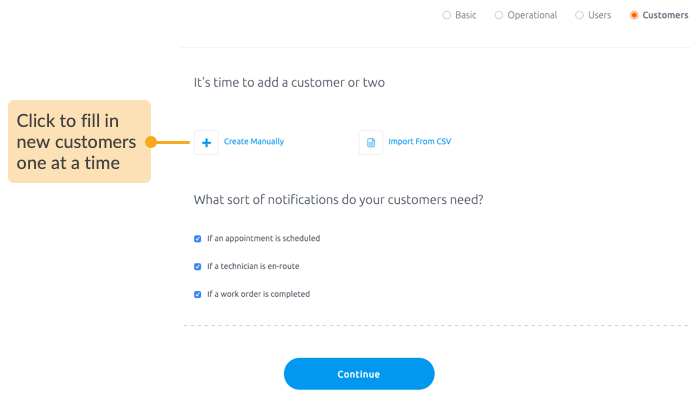 Once you're inside the app, you can check out the sample job to get an idea of how a new job will appear in your Calendar, Notifications and Jobs area. Explore how you will Accept the job and begin clocking your hours at every stage through to job completion. Next, go ahead and start creating new jobs, tasks, add a team member, new customer, create asset and much more. For more information, please read our articles in Using Loc8 Mobile.